There is a company called Sterling by Musicman sells licensed imported copies of Ernie Ball Musicman instruments, and they recently introduced a budget series of instruments under the SUB moniker, which can be really confusing. 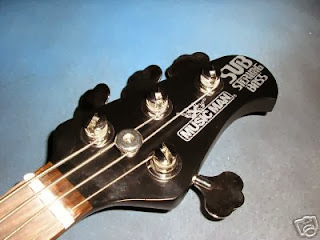 You see, the Ernie Ball Musicman also sold a SUB line of instruments in the 2000s, and one of them was the Sterling bass. We are looking at of the originals today, a 2006 American-made Musicman Sub Sterling. Back in 2003, the Ernie Ball company wanted to provide a lower-cost alternative to their top shelf guitars and basses; the Musicman SUB line of instruments came from this idea. These instruments were built in the same San Luis Obispo factory as their other products, but with features that made them more affordable. This included cheaper body woods and hardware, as well as textured finishes that required less labor and no polishing to complete. It does not say “Ernie Ball” anywhere on this bass. Obviously, the SUB Sterling was their take on the Sterling, which has a smaller body and narrower neck than the Stingray. 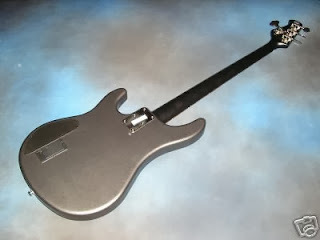 This one has a non-contoured poplar body that is finished in Graphite Gray, of which I have seen very few. Other available colors were: White, Black, Teal, Red, Blue, and Cinnamon. 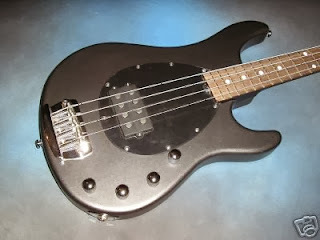 Many of the SUB instruments came with a lame faux diamond plate pickguard, but the later ones came with a black plastic guard. It makes all the difference in the world in the appearance of this bass. The neck is maple (painted satin black) with a 11-inch radius rosewood fretboard and 22 high-profile, wide frets sunk into the fretboard. This is a 34-inch scale instrument, and the neck is 1.5-inches wide at the compensated plastic nut (early SUB basses did not get the compensated nut). 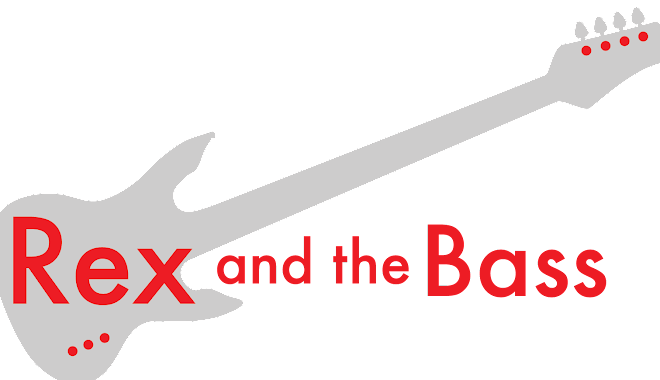 The neck on SUB basses is attached to the body with six bolts and they get the usual truss rod wheel for easy adjustments. By the way, there was also a fretless model available, and they came with a pau ferro fingerboard. The hardware is a bit cheaper than what is found on the Ernie Ball basses. The chrome-plated open gear tuners are not from Schaller, and though the bridge is similar it seems a bit cheaper (but it still has stainless steel saddles). They had to get the price down somehow, you know. The electronics are not from the bargain bin, though. These basses come with a single Musicman humbucker that has a volume control and a 3-band EQ. I am not sure if they have the phantom coil or not, and I never took mine apart to see. So, this was really a good bass, regardless of how much it cost (which wasn’t very much, really). The pickup is mighty, and it has that distinctively strong Sterling tone that quite pleasing. Though the hardware was not quite as good as the stuff on their higher-priced models, I never noticed any problems with sustain or tuner slippage. The craftsmanship was what I expected to see coming out of San Luis Obispo – the neck pocket was tight and the frets were good, with nicely finished edges and a level fretboard. It weighed a touch under 9 pounds, and it balanced nicely on a strap. The non-contoured body was uncomfortable for me, as I was used to contoured Sterlings by the time I got the chance to own one of these. Overall this was a great bass, but I was always more of a Stingray guy instead of a Sterling guy anyway. You know how it is – old dogs and new tricks…. 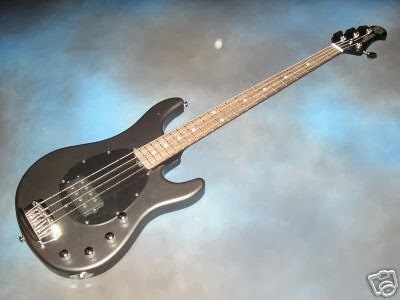 The MusicMan SUB Sterling basses were made from 2003 to 2006, and back then they were quite a bargain, with a list price of around $1000 and a street price of $700 or so, if I remember correctly. They did not make a very many of these basses, and I do not see them come up on the used market very often. But when they do, they usually sell for well under $500 bucks, which is a good deal on a US-made bass that plays well and sounds good.